Q1. True or false: LLQ is recommended for VoIP networks. Answer: True. Cisco recommends low-latency queuing for VoIP networks. Q2. True or false: H.323 is an IETF standard, and SIP is an ITU standard for multimedia protocols. Answer: False. H.323 is an ITU standard, and SIP is an IETF standard for multimedia. Q3. True or false: An Erlang is a unit that describes the number of calls in an hour. Answer: True. An Erlang is a telecommunications traffic unit of measurement representing the continuous use of one voice path for 1 hour. Q4. What do you implement to stop packets from being transmitted when there is silence in a voice conversation? Answer: VAD. Voice-activity detection suppresses packets when there is silence. Q5. The variable delay of received VoIP packets is corrected with what kind of buffers? Answer: Dejitter buffers are used at the receiving end to smooth out the variable delay of received packets. Q6. True or false: Common Channel Signaling uses a separate channel for signaling. Answer: True. With CCS, a separate channel (from the bearer channels) is used for signaling. Q7. True or false: FXO ports are used for phones, and FXS ports connect to the PSTN. Answer: False. You use FXS ports to connect to phones and FXO ports to connect to the PSTN. Q8. True or false: SS7 provides mechanisms for exchanging control and routing messages in the PSTN. Answer: True. SS7 implements call setup, routing, and control, ensuring that intermediate and far-end switches are available when a call is placed. Q9. An organization uses what kind of system to gather and provide information for the customer before transferring her to an agent? Answer: Interactive voice response (IVR) system. IVR systems connect incoming calls to an audio playback system that queues the calls, provides prerecorded announcements, prompts the caller for key options, provides the caller with information, and transfers the call to another switch extension or agent. Q10. An organization uses what kind of system to route calls to agents based on the agent skill group or call statistics? Answer: customer service departments, and other call centers. Q11. In addition to codec selection, both _______ and _______ can be used to reduce the bandwidth of VoIP calls. Answer: cRTP and VAD. Both cRTP and VAD reduce the amount of bandwidth used by VoIP calls. G.729 calls can be reduced from 26.4 kbps to 11.2 with cRTP and to 7.3 with cRTP and VAD. Answer: A, B, C, and E are fixed; D is variable. Fixed-delay components include processing, serialization, dejitter, and propagation delays. Variable-delay components include only queuing delays. Q13. How can you reduce serialization delay? Answer: You reduce the frame size with fragmentation or increase the link bandwidth. The formula is serialization delay = frame size/link bandwidth. Answer: PQ-WFQ and LLQ. Both of these queuing techniques use a strict-priority queue. LLQ also provides class-based differentiated services. 15. True or false: The maximum one-way delay in the G.114 recommendation for acceptable voice is 200 ms.
Answer: False. The G.114 recommendation specifies a 150-ms one-way maximum delay. 16. True or false: FRF.12 is an LFI standard used in networks with VoFR and VoIP over Frame Relay. Answer: True. FRF.12 specifies LFI for Frame Relay networks. 17. An assessment of a network determines that the average round-trip time between two sites is 250 ms. Can an IPT solution be implemented between the sites? Answer: Yes. An RTT of 250 ms means that the average one-way delay is 125 ms, which is less than the recommended maximum of 150 ms.
Q21. Which protocol is preferred for inter-PBX trunks? Answer: C. Q.SIG is the preferred protocol for inter-PBX trunks. Q22. cRTP compresses the IP/UDP/RTP header to what size? d. It compresses the RTP header only. Answer: A. cRTP compresses the IP/UDP/RTP headers from 40 bytes to 2 or 4 bytes. Q23. The steps of converting an analog signal to digital format occur in which order? Answer: B. The analog signal is filtered and then sampled, and then samples are digitized. Q24. Digitizing is divided into which two processes? Answer: C. The digitizing process is divided into companding, and quantization and coding. Q25. Which of the following are goals of IP telephony? Answer: D. All answers are correct. Q26. An analysis of a 384-kbps WAN link shows complaints of voice quality issues between two sites when large file transfers take place. The circuit is running at 45 percent utilization. What QoS schemes should be implemented to alleviate this? Answer: B. LFI and cRTP should be implemented to help with the serialization delay on slow-speed WAN circuits. LLQ will not help because the circuit has no congestion. Q27. Which codec is recommended for use in WAN links? Answer: D. The G.729 codec is recommended on WAN links because of its lower bandwidth requirements and relatively high MOS. Answer: C and D. cRTP and VAD reduce the amount of IP bandwidth used in IPT calls. Q29. Which of the following statements is true? a. CAC prevents voice calls from affecting other voice calls. b. CAC prevents voice calls from affecting data bandwidth. c. CAC prevents data from affecting voice calls. d. CAC prevents data from affecting other data traffic. Answer: A. CAC prevents new voice calls from affecting existing voice calls. Q30. What IPT component contains the dial plan and is used to register IP phones? Answer: D. The Cisco Unified CallManager performs the call processing functions of the Cisco IPT solution. Q31. Which are drivers for Unified Communications? Q32. Match the H.323 component with its description. Answer: A = iv, B = iii, C = ii, D = i.
Q33. Which IPT component provides the call processing component? Q34. Which protocol is used for communications between two IP endpoints? Answer: H. RTP is used to transport voice streams between two endpoints. Q35. Which protocol is an IETF-defined application layer control protocol used to establish and terminate calls between two or more endpoints? Answer: B. SIP is defined is RFC 2453 and is used to establish, maintain, and terminate calls. Q36. Which protocol is defined in RFC 3661 and used by CUCM to control gateways? Answer: D. MGCP is used to control gateways. Q37. Which services from the Media Services Framework provide capture of media streams? Answer: D. Storage services provide capture and storage of media streams. Q38. Which services from the Media Services Framework provide transcoding? Answer: C. Bridging services provide transcoding and recording services of media streams. Q39. Which traffic type is recommended for AF4 PHB? Answer: D. Multimedia conferencing should be provisioned on DSCP AF4 PHB. Q40. Which traffic type is recommended for CS2 PHB? Answer: F. OAM should be provisioned on DSCP CS2 PHB. Q41. Which traffic type is recommended for CS4 PHB? Answer: D. Real-time interactive media should be provisioned on DSCP CS4 PHB. Q42. Which CODEC generates an 8-kbps bit rate? Answer: D. G.729 generates an 8-kbps bit rate. Q43. Which CODEC generates a 64-kbps bit rate? Answer: A. G.711 generates a 64-kbps bit rate. Q44. Which is the recommended QoS mechanism for VoIP networks? Answer: C. LLQ is recommended for most VoIP networks. Q45. How much bandwidth is generated by Cisco TelePresence 3000 at 1080p? Answer: A. Cisco TelePresence 3000 generates 12.3Mbps worth of traffic at 1080p. Q46. How much bandwidth is generated by VT Advantage? Answer: D. Cisco Video Advantage generates 768 kbps worth of CIF traffic. Use both the scenario described in the following paragraph and Figure to answer the following questions. 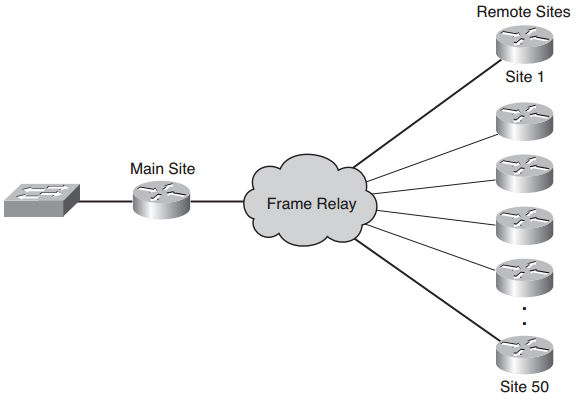 The client has an existing Frame Relay network, as shown in Figure. The network has a large site and 50 small remote sites. The client wants a design for a VoIP network. The client wants to provide differentiated CoS for the voice, Systems Network Architecture (SNA), FTP, and other traffic. Q47. Based on the current network diagram, which Cisco IPT deployment model should you recommend? Answer: Multisite WAN with centralized call processing with a CM cluster at the main site and SRST routers at the remote sites. Q48. What feature should you recommend to provide call processing in the event of a WAN failure? Answer: SRST enables the remote routers to provide call-handling support for IP phones when they lose connectivity to the CallManagers because of a WAN failure. Q49. Which queuing technique should you recommend? Answer: LLQ provides a strict queue for RTP (VoIP) traffic and differentiated class of service for all other traffic. Q50. For Site 1, the current data traffic is 512 kbps, and video traffic is 0. What is the minimum bandwidth required to support four concurrent VoIP G.729 calls plus the data traffic to the site? Answer: The minimum bandwidth is approximately 640 kbps. Each call is 30 kbps times four, which equals 120 kbps. The exiting 512 kbps of data traffic equals 640 kbps. The circuit should be provisioned at a higher speed to prevent the sustained peak utilization from being higher than 70 percent. Q51. Should you implement a multisite WAN with centralized call processing CUCM cluster? Answer: Yes, a CUCM cluster should be implemented at the main site. Q52. What feature can you use to reduce bandwidth over the WAN links? Answer: cRTP compresses the RTP/UDP/IP headers from 40 bytes to 2 to 4 bytes. Q53. Which LFI technique should you use to reduce the serialization delay? Answer: FRF.12 is the link and fragmentation technique used in Frame Relay networks. Q54. Which International Telecommunication Union (ITU) standard provides a framework for multimedia protocols for the transport of voice, video, and data over packetswitched networks? Answer: C. H.323 is the ITU standard that provides a framework for the transport of voice, video, and data over packet-switched networks. Q55. What is the default coder-decoder (codec) used with VoIP dial peers? Answer: D. The default codec in Cisco VoIP dial peers is G.729, which has an 8 kbps bit rate. Q56. Real-time Transport Protocol (RTP) operates at what layer of the OSI model? Answer: C. RTP operates at the transport layer of the OSI model. Q57. Which H.323 protocol is responsible for call setup and signaling? Answer: C. The H.225 standard defines the procedures for call setup and signaling. Q58. What unit represents the average number of concurrent voice calls, commonly calculated for the period of 1 hour? Answer: B. An Erlang is a unit that describes the number of calls in an hour. Q59. Which feature does not transmit packets when there is silence? Answer: B. VAD reduces traffic by not transmitting packets when there is silence in voice conversations. Q60. What does Compressed Real-time Transport Protocol (cRTP) compress? Answer: C. cRTP compresses the RTP, UDP, and IP headers. Q61. Which QoS mechanism is recommended for VoIP networks? Answer: B. LLQ is recommended for VoIP networks. Q62. Where is the local loop located? Answer: A. The local loop is located between the traditional phone and the CO switch. Answer: C. Jitter is the variance in the amount of per-packet delay incurred during the transport of packets across the network, such as packets in an IP telephony voice call.